According to a New York Times article a few years ago, “For Elderly, Fear of Falling Is a Risk in Itself,” an estimated 10,000 people 65 and over die each year from injuries related to falls. Studies show that 30 to 50 percent of elderly people fear falling. This fear can itself actually increase the risk of falls. As Patricia A. Miller, an occupational therapist and professor of occupational therapy at Columbia University points out, when people are afraid of falling, they often impose immobility on themselves. 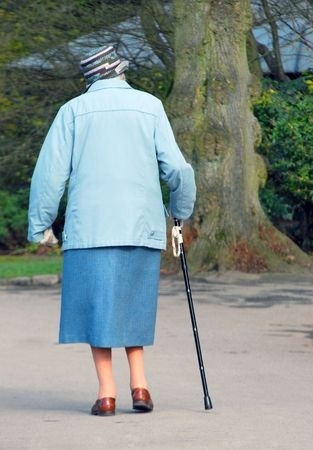 As they do less, their physical condition deteriorates, making them more susceptible to falls. What they fear becomes more likely. Worse yet, this self-imposed inactivity often leads to depression which requires medication and the medications usually prescribed make falls more likely. Sometimes, the depression leads to drinking which also makes falls more likely. The combination of medication and drinking is particularly dangerous in this regard. Some things have been shown to lessen the risks – better lighting, modified furniture and the like. Strengthening exercises and activities like yoga and tai chi may also be useful. But the teaching method pioneered by the late of F. Matthias Alexander, the developer of the Alexander Technique, can be especially helpful in helping older people improve their balance, thereby lessening the likelihood of a fall. The Alexander Technique can be described as a way to learning how to release harmful tensions from your body – tensions that get in the way of efficient functioning. Excess tension – particularly in the neck – has an immediate effect of balance. The neck is the connecting link between your body – which does the moving about – and your head, where those two important balance organs, your eyes and ears (more precisely, your inner ear canals) are located. Anything which interferes with the fluidity of that connection is bound to create balance problems. It’s not uncommon for older adults to carry quite a bit of tension in their necks, and elsewhere in their bodies, without being aware of it. A major problem with this kind of chronic tension is that over time the “I am tense” signals from the affected muscles get cut off. Often older people with severe neck tension actually feel little or nothing in their necks. What they do notice, of course, are the results of that tension – restricted breathing, stiffness in their joints and, of course, increased risk of falling. Although harmful tension habits are often become more deeply entrenched as we age, a hundred years experience of teaching the Alexander Technique has shown that these habits can be changed if there is a willingness and commitment to do so. In fact, many students of the Technique begin taking lessons in their 70s, and 80s. George Bernard Shaw is a famous example. He was in his late 80s when he started taking lessons with Alexander.